At first glance this recipe may seem a bit complicated, but it’s actually easy enough for even a novice cook to pull off. This enticing dish has all the flavors of layered lasagna but with far less hassle. 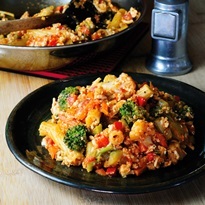 Both the vegetable and tofu ricotta mixtures can be made while the pasta is cooking. To cook the pasta, fill a large saucepan two-thirds full with water. Add the optional salt and bring to a boil over medium-high heat. Add the pasta and cook, stirring occasionally, according to the package instructions or until tender. Reserve ¼ cup of the pasta water. Drain the pasta in a colander and return it to the saucepan. While the pasta is cooking, make the vegetable mixture. Put the frozen vegetables, onion, bell pepper, and oil in a large nonstick skillet and cook over medium heat, stirring occasionally, for 5 minutes. Add the garlic and Italian seasoning and cook, stirring occasionally, until the vegetables are tender, 2 to 3 minutes. While the vegetable mixture is cooking, make the tofu ricotta. Put the tofu, nutritional yeast, and lemon juice in a small bowl. Add the reserved pasta water and mash with a fork to combine. Add the tofu mixture to the cooked pasta and stir until well incorporated. Add the pasta mixture to the vegetable mixture in the skillet and stir to combine. Add the marinara sauce and cheese and stir until evenly distributed. days in the refrigerator. Warm in a small saucepan or skillet over medium-low heat before serving. This recipe is reprinted with permissions from Vegan for One: Hot Tips and Inspired Recipes for Cooking Solo by Ellen Jaffe Jones and Beverly Lynn Bennett.